The Rubber Hasn’t Met the Road. Response to the Department of Transportation’s Letter to the Washington Post. The DOT claimed that it was “ahead of the curve” because it complied with President Obama’s and Attorney General Holder’s 2009 instructions on FOIA. While I might not classify obeying instructions from the Attorney General and President as being “ahead of the curve,” The Archive did identify that the DOT had made some FOIA progress —in last year’s FOIA Survey. Still, the DOT was ranked as a second tier –not first tier– agency. It provided documents showing it had updated its training materials, but could not show concrete change in its FOIA practices. This year’s Knight Open Government Survey shows that at the DOT FOIA Office, the rubber hasn’t met the road. In March 2010, Chief of Staff Rahm Emanuel and White House Counsel Bob Bauer sent a memo to all agencies asking them to take two specific steps to evaluate their FOIA performance. In the 2011 FOIA Survey, we used a FOIA request to ask for documents showing action on the steps demanded by the Emanuel-Bauer FOIA Memo. So, by their own testimony, they did not respond to the Emanuel-Bauer memo, which specifically asked them to (1) update their FOIA training and guidance materials, and (2) assess the adequacy of their FOIA resources. The Knight Open Government Survey in effect is a FOIA aptitude test. A FOIA office that is truly responsive to the public would have sent us –as many agencies did– copies of their PowerPoint training materials, copies of their internal correspondence about the Emanuel-Bauer memo, copies of the meeting agenda when the Chief FOIA Officer and Departmental Officer met to review their FOIA progress, copies of whatever memo they sent back to the White House, or even a draft of what would become their Chief FOIA Officer report due on February 1, 2011. Any of these responses would have gotten DOT a passing grade on our Survey. 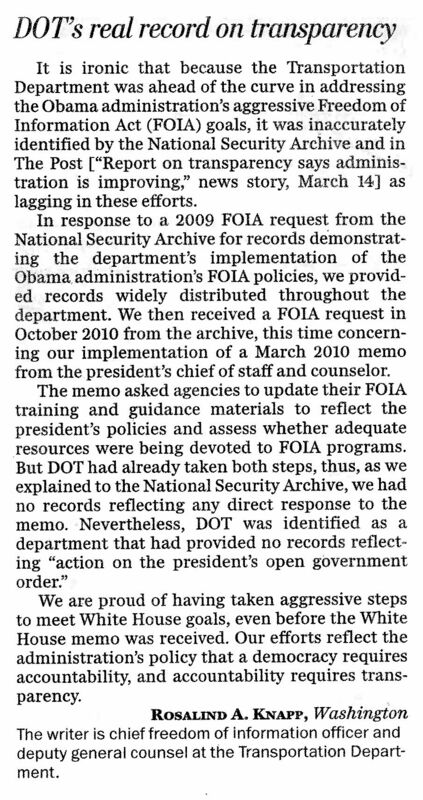 Furthermore, the results of DOT’s Fiscal Year 2010 FOIA report show that the DOT was incorrect in “determin[ing] that no specific steps were necessary” to improve its FOIA policies. In FY 2010, an average simple pending FOIA request had been sitting in the DOT queue for more then 141 days. The law requires 20. The Department of Transportation has unprocessed FOIA requests dating from 2005. The Department of Transportation clearly has work to do “to meet White House goals” on FOIA. It can begin by following FOIA instructions issued by the Chief of Staff and White House Counsel.